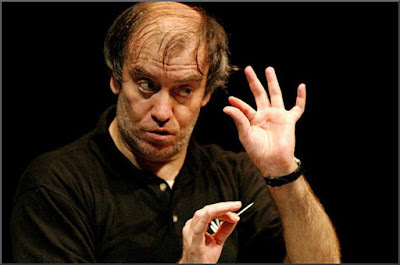 The recent downgrading of Valery Gergiev's reputation to music's equivalent of junk bond status by a prominent critic - performances of "often ...featureless mediocrity" - shows the dangers of classical music's guru fixation. In 2012 Newsweek declared that Gustavo Dudamel was "the saviour of classical music". To date the saviour from Venezuela has not been crucified by the critics; but it is now generally acknowledged that, like many celebrity musicians, he is a a mere mortal with a wooden baton and a golden wallet. As one guru falls from favour, the commercial-musical complex of agents, media companies and embedded journalists ensures that a liberally hyped newcomer - the younger the better - is ready to take their place. The irony is that Valery Gergiev and Gustavo Dudamel and their over-hyped colleagues are all huge talents. Yes, they have doubtless aided and abetted their own elevation to exalted status. But the real blame lies with the commercially-driven guru fixation, which builds expectations that never have a chance of being met. Not only does this dangerous fixation divert attention and much needed resources away from the long tail of musicians on the wrong side of the celebrity divide, but it also triggers the boom and bust career cycle of so many celebrity musicians. This boom and bust cycle is vividly illustrated by Simon Rattle. He was acclaimed as the guru that would revitalise the Berlin Philharmonic. But despite some fine achievements, he is leaving Berlin on an equivocal note, having disappointed those who were awaiting Herbert von Karajan's second coming. Now, the very critics and London Symphony Orchestra musicians who said good riddance to Gergiev, are hailing Rattle as the new saviour of the LSO, and are even building him a concert hall. Déjà vu anyone? Today the term guru is commonly used to identify a popular expert - eg. management guru - and the term is used in that context in the preceding paragraphs. But the true definition of a guru is a Hindu spiritual teacher. In India music is considered to be a sacred art, and the term guru is used in its correct context when a pupil refers to his music teacher as his guruji. However the common usage definition of popular expert, and the technical definition of Hindu spiritual teacher have become confused even in the case of Indian musicians, with the example of Ravi Shankar providing an informative case study. It is beyond dispute that Pandit Shankar was a musician and spiritual teacher of the highest order. But had he stayed in India it is doubtful if his name would be known at all to Western audiences. However, he first toured outside India in 1956, went on to work with George Harrison, Philip Glass, and other celebrated Western musicians, and became known as the guru - popular expert - who brought Indian music and the sitar to the West. Which means that today, three years after his death, in many Western eyes Ravi Shankar is Indian music, and similarly, the sitar is Indian music. The Shankar problem is illustrated by the graphic above. It is a blurred screen grab from the video of the 1993 Concert for Peace in the Royal Albert Hall, London presented by the Rajiv Gandi Foundation. For me the double CD of this concert on Moment Records is one of the greatest recordings ever made. But I rejected taking the easy route and showing the CD artwork; because both the front and back artwork only show Ravi Shankar. The concert and the recording - in excellent sound incidentally - were both triumphs. But not just for Ravi Shankar: because tabla player Zakir Hussain (back to camera) and sarod player Partho Sarathy (facing camera) also gave triumphant performances. Yet it was difficult to grab even that shaky image, because the Asia TV video feed concentrates almost exclusively on Pandit Shankar; with only the occasional cutaway allowing glimpses of Zakir Hussain - who gave the performance of his life - and Partho Sarathy. 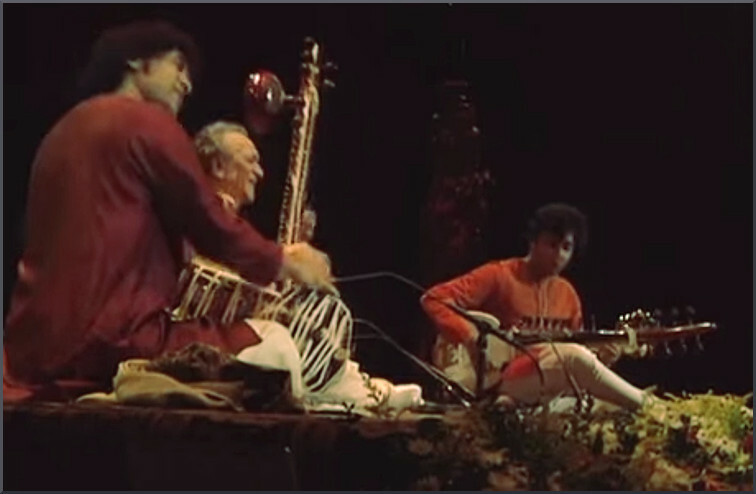 For the Concert for Peace the sarod was played by the young Partho Sarathy; however Ali Akbar Khan was the sarod player best-known for working with Ravi Shankar. The title of 'musician who first brought Indian music to the West' is fairly meaningless; but if it is to be awarded, it should go to Ali Akbar Khan. At Ravi Shankar's recommendation, Ali Akbar Khan visited America in 1955 - a year before Shankar's first visit - with tabla player Chatur Lal; they became the first Indian musicians to play on American TV, and recorded a pioneering album for Angel Records. Ali Akbar Khan was also an influential teacher; in 1956 he founded the Ali Akbar College of Music in Calcutta, this was followed in 1967 by another college of the same name in Berkeley, California (later San Rafael), and in 1985 by the Ali Akbar College of Music in Basel, Switzerland. The Basel college was founded under the direction of Ali Akbar Khan's American pupil Ken Zuckerman, who is seen above. 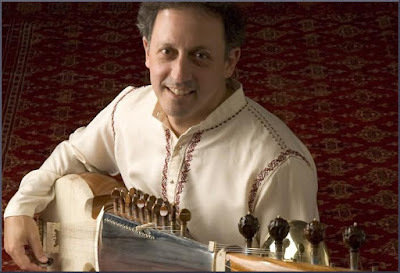 Born in New Jersey 1952, Ken Zuckerman is now one of the world's finest sarod players. I first saw him play in Jordi Savall's Francisco Xavier project at the Cite de la Musique, Paris in 2009, where his improvised raga on the plainchant O Gloriosa Domina with tabla player Prabhu Edouart was the highlight of the concert, and over the years Ken Zuckerman has made several appearances On An Overgrown Path. In the West, Indian music remains inextricably linked with Ravi Shankar and the sitar. Which means, quite wrongly, that world class - and I use that description advisedly - musicians such as sarod master Ken Zuckerman remain almost unknown. I have written here before in praise of the Cambridge University Indian Classical Arts Society (CUICAS). This student run society is bringing Ken Zuckerman to Cambridge on Sunday for a recital with tabla player Sanju Sahai. The recital is being billed as a New Horizons event, in recognition of the need to broaden Western audience's appreciation of Indian music beyond its current narrow guru fixation. I have no professional connection with CUICAS, and, in view of the thrust of this post, I don't want to over-hype the concert. But CUICAS has taken a big financial gamble bringing Ken Zuckerman to Cambridge, and they need all the support they can get. Ken Zuckerman and Sanju Sahai start their concert at 5.00pm this Sunday, October 25th in Cripps Court Auditorium, Magdalene College. Tickets, which are eminently affordable at £15, can be bought from the ADC Theatre website, or by phone 01223300085. If you are in the Cambridge region I do hope to see you at the concert on Sunday. No complimentary tickets or other benefits involved in this post. Header image credit Rex Features; Concert for Peace from YouTube video, Ken Zuckerman via InstaEvents. Any copyrighted material is included as "fair use" for critical analysis only, and will be removed at the request of copyright owner(s). Also on Facebook and Twitter. It's possible to revitalise the Berlin Philharmonic AND disappoint those who wanted Herbert von Karajan's second coming: indeed, arguably impossible to do the former without doing the latter. Guru as Hindu spirital teacher - if you look closely at my screengrab from the Concert for Peace you can just see the outline of the ten feet high statue of Lord Krishna that shared the stage with the musicians. A most interesting piece, perhaps even worth more than one response. Ravi Shankar - we saw him on his first (I think) visit to Toronto in Massey Hall (2700+ seats). Shankar had the advantage of very positive stage presence, and was able to speak to the audience in an informative and genial manner (a skill not shared by all that many performers, in my experience). He explained the instruments, a bit about the music, and he and Alla Rakha gave a fascinating demonstration of some more complex rhythms, used the rhythms in demonstrating call/answer between their two instruments, and ended with each playing a short segment in two very different rhythms. They explained to the audience what to listen for, how to anticipate when the two lines would "come together" rhythmically, and signalling various key points with fairly boisterous body language. A memorable concert, and 2 memorable artists. This memory brings to mind another artist who played Massey Hall several times and who shared Shankar's gift for direct and delightful spoken communication - Julian Bream. Have just dug out a couple of LP's for each for evening listening, and have ordered the recording of the Concert For Peace at long last. Also pleased to see the words about Ali Akbar Khan. I recall that Bream called him "perhaps the finest instrumentalist I have ever heard." And yes, here are a couple of his recordings. Will be an enjoyable evening. Pleased to see (and agree with) the comments about hype. I have a visceral reaction against extreme hype which borders on being irrational. Example - I have not listened to anything by either Lang Lang or Gustavo Dudamel. Perhaps I'll catch up with them in a few years, but for the moment, I don't feel the loss. There are more than enough excellent and interesting artists around that I'd rather avoid sorting through the plethora of fawning comments and determine which recordings to try. My loss? Perhaps ... but I'm not losing sleep over my shortsightedness. Ken Zuckermann? Thanks to you, there's an artist I will investigate. "Ken Zuckermann? Thanks to you, there's an artist I will investigate" = job done.